Feb 3 - “Bread Lines” © artwork by Julie Lonneman. The table fellowship of Christians implies obligation. It is our daily bread that we eat, not my own. We share our bread. Thus we are firmly bound to one another not only in the Spirit but in our whole physical being. 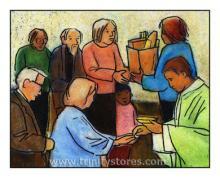 The one bread that is given to our fellowship links us together in a firm covenant. Now none dares go hungry as long as another has bread, and the one who breaks this fellowship of the physical life also breaks the fellowship of the Spirit. Apr 23 - “St. George of Lydda” © icon by Joan Cole. Happy Feast Day St. George! Apr 22 - “St. Francis, Le Fou de Dieu” © icon by Fr. Michael, Reyes, OFM. Apr 21 - “Easter Morning” © artwork By Br. Mickey McGrath, OSFS. Apr 21 - “Resurrection - Myrrh Bearing Women” © icon by Joan Cole. Apr 20 - “Seraphic Christ” © icon by Br. Robert Lentz, OFM. Apr 19 - “St. Emma” © icon by Joan Cole. Happy Feast Day St. Emma! Apr 19 - “Crucifixion” © icon by Joan Cole. Apr 19 - “San Damiano Crucifix” © icon by Br. Robert Lentz, OFM. Apr 18 - “Garden Madonna” © artwork by Br. Mickey McGrath, OSFS.